This came out a little darker than I wanted, but sometimes you just have to go with how the juices flow on a particular day. I'm almost thinking that there is too much texture on this card -- almost! I always forget how nice Craft inks look on Kraft paper -- it's one of my favorite looks. 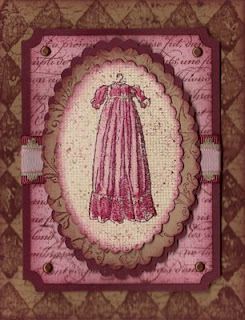 I layered Kraft, Bravo Burgundy and Pink Pirouette. The main Kraft layer is stamped with Print Pattern and Weathered in BB craft ink and the edges sponged in BB classic. The Pink Pirouette layer is stamped with En Francais in Bravo Burgundy craft, Canvas in Sahara Sand and the spatter from Itty Bitty Backgrounds in Bravo Burgundy and Sahara Sand classic. The corners are punched with the ticket corner punch and the edges sponged with BB classic. The central image is stamped in Bravo Burgundy classic ink and lightly watercolored in Pretty in Pink. It was then overstamped with Canvas in Sahara Sand and the spatter from Itty Bitty Backgrounds in Pretty in Pink, Bravo Burgundy and Sahara Sand. The edges are sponged with Bravo Burgundy. The Kraft "frame" behind the central image is stamped with Filigree in Bravo Burgundy and also sponged around the edges with BB. The ribbon is whomped together by layering Pink Pirouette taffeta ribbon over a Sahara Sand ribbon from the Beachfront Ribbon Originals. Behind the Beachfront ribbon, two strips of Burgundy 1/4" grosgrain were attached top and bottom to make it look like one solid layer of burgundy ribbon.This came out a little darker than I wanted, but sometimes you just have to go with how the juices flow on a particular day. I'm almost thinking that there is too much texture on this card -- almost! The ribbon is whomped together by layering Pink Pirouette taffeta ribbon over a Sahara Sand ribbon from the Beachfront Ribbon Originals. Behind the Beachfront ribbon, two strips of Burgundy 1/4" grosgrain were attached top and bottom to make it look like one solid layer of burgundy ribbon. Wow, this is just beautiful. So elegant. Beautiful!! I have been waiting patiently to see this every since you said you were going to use this set -- it was well worth it. And it is perfect -- love all the texture and details. I have a couple on my SCS gallary (from a year ago) using this set, now you having given me the urge to get it back out! !